Howdy folks! I’m back again. This time with the start of a tactica series on my current army: Death Guard. I’ve managed to trial almost everything in the codex now, though I’ve not really done fully competitive lists yet, because I wanted to trial all the new toys! 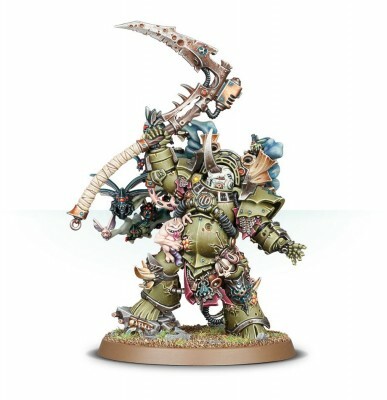 Typhus – The commander of the 1st company and host of the destroyer hive is a beast in 8th and for only a few points more than a lord of contagion. He gets all the lord of contagion abilities plus a shooting attack and the ability to cast 2 spells a turn and deny 1, plus a better scythe. I have yet to find a reason not to take him in a list, beyond fluff. He is 175 points of awesome. Malignant Plague Caster – This model spams mortal wounds in the psychic phase. He needs to be up close and personal but with his staff he’s not exactly a slouch in combat for a rot wizard in space. His main use is close range support, because for each psychic power he casts on a 7+ roll does a mortal wound to the nearest enemy unit within 7”. This can really rack up with smites and curse of the leper or plague wind. If you use the relic staff you get +1 to cast smites so getting that 7 (or 10+ for the d6 mortal wounds) is even easier. A pair of these supporting plague marines on your front line can be devastating, as the ability even triggers off the buff spells you cast on your own army. Definitely take at least one of these. Chaos Lord – An aura of rerolling 1’s to hit? Yes please. Especially with the PM having easy access to extra plasma guns. Add in the 4++ inv save and good weapon options and the Chaos lord is definitely worth his points. A favourite build of mine is to give him a balesword, combi bolter and the superating plate relic. This gives him 4 shots at 18” range and a plague power sword to benefit from various powers and effects but more importantly gives him a 2+ armour save and for every save passed, either armour or invulnerable, you roll a die and on a 4+ the attacking unit suffers a mortal wound. This means that he can deal potentially a huge amount of mortal wounds to attackers. Even before he himself attacks. Chaos Lord in terminator armour – As above but with a built in 2+ save and the ability to teleport in. Use him to get your terminators (especially those with combi plasma guns) to reroll those dreaded 1s. Daemon Prince – These have received a bit of a buff in 8th ed. They can still be pretty fragile but being a character with less than 10 wounds mean they can hide from shooters behind drones and other units. Equip it with wings and talons and it’s a very fast melee blender who will chew through MEQ squads like butter, and even threaten TEQ with the 2 dam per attack. He also has an aura of rerolling 1’s to hit, which is nice and this effects all nurgle/chaos models within 6”. Sorcerer – This is the power armoured sorcerer. Its limited to the contagion discipline but lacks the statline of the plague caster or its aura ability. Its cheaper but its massively outclassed by the Plague Caster. If you use the Index you can take one with a jump pack and access to the CSM heretic powers which let you cast warptime to help with the slow speed of the Death Guard or death hex to remove inv saves. However it just doesn’t feel very deathguard. Likely to be found in competitive armies only just for the spell list access. Sorcerer in terminator armour – gets a 2+ save a 5+ inv and the ability to teleport strike into the game. But costs a fortune in points. Useful if you don’t take typhus and want to buff your terminators but is outclassed by the more points efficient and more powerful Typhus. Lord of Contagion – slow, costly in points, no shooting attack, limited aura (only works in the fight phase and up close and personal – no reroll aura here). If you want a terminator lord go for typhus. For a few points more you get a much much better set of abilities. 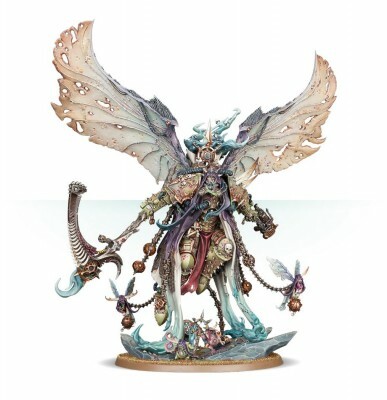 Mortarion – I know what you’re thinking. T’Other has gone insane and wrong. Morty isn’t bad or terrible? He’s a massive damage dealer and so tough….You’re right. However his rules are very very strange. 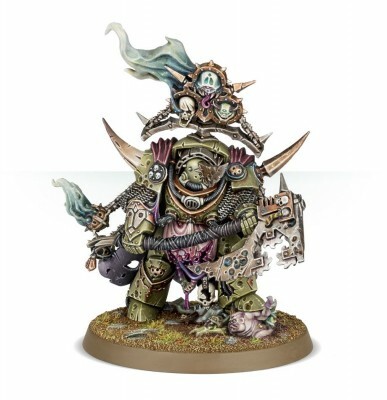 He is one of the fastest units in the Codex, easily outpacing the infantry by a galactic mile, but he also has several auras (master of the Death Guard and his warlord trait) which work best when he is surrounded by an army. As a monster character with 18 wounds he is able to be targeted whether he is closest or not and whilst he does have a 3+ save, 4++ invulnerable and a 5+ FNP he’s still remarkably fragile. The safest place for him on the board is in close combat. He is able to dish out a huge amount of hits and damage there and if the enemy remains locked in combat with him he cannot be shot. You will usually see people sending him out solo or supported by a winged daemon prince or a drone or 2. This means he is not making the most of his army buffing auras. From my POV mortarian is a lovely thematic model but his rules are a bit of a conflicting mess and could make more sense. Hell even if he had an alternative warlord trait that would work better for me. Anyway. That’s it for a run down of the HQ choices for the Death Guard Army (and a sneaky Lord of war) based on my experience with them. All in All none of them are utterly terrible but some far outshine the others.